In a game that was mostly in Nashville's control, a four-run Round Rock inning in the eighth completed a five-run comeback as the Sounds lose to the Express 8-6. Nashville then had a huge inning in second. Matt Davidson and Danny Santana started by walking followed by a single by Andy Ibanez to load the bases with no outs. Jose Trevino then hit a sharp line drive to center field that scored Davidson but forced out Santana at third base. Adam Moore kept it rolling with a hard single to right-center field. Fisher ended up misplaying the ball and it rolled to the fence, scoring Ibanez and Trevino. Carlos Tocci later topped the inning off with a two-run homer that scored Moore to put the Sounds up 5-1. The Sounds scored again in the top of the third. Willie Calhoun singled to begin the inning and was then hit in by Santana to make it 6-1. Round Rock responded with three runs in the bottom of the third. Jamie Ritchie led off with a double and Alex De Goti then hit a single to put runners on first and third base. Straw hit a double to knock in Ritchie and put De Goti on third. 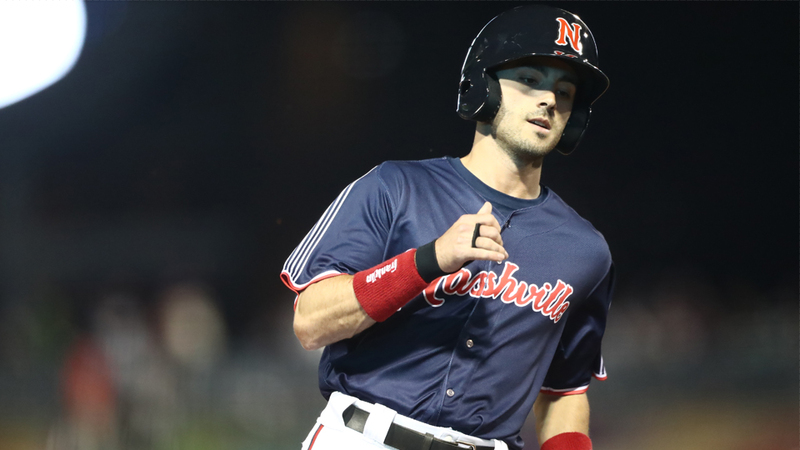 Straw and De Goti later scored on a Jack Mayfield double, cutting the Nashville lead 6-4. Sounds' starter Wes Benjamin retired four straight batters before being relieved in the sixth inning by Zac Curtis. Curtis then retired six straight batters before being relieved by CD Pelham in the bottom of the eighth. Round Rock made their comeback in the bottom of the eighth inning by plating four runs. Straw led off with a hit-by-pitch and stole second and third base to be hit in by Mayfield. After Yordan Alvarez followed with a walk, Kyle Tucker doubled on a line drive to right field that scored Mayfield to tie the game. With runners on second and third, Taylor Jones played the hero with a go-head two run single that ultimately gave Round Rock the 8-6 win. The Sounds travel to San Antonio for Friday's matchup against the Missions for their first ever matchup. Right-hander Richelson Pena (0-1, 1.80) starts for the Sounds against right-hander Aaron Wilkerson (1-0, 1.80) for the Missions. First pitch is scheduled for 7:05 p.m.
With tonight's loss, the Sounds are now 2-6 on the season. Nashville's five runs in the second are the most runs they've scored in an inning this season. Wes Benjamin and Benjamin Curtis combined to put down 10 consecutive batters from the fourth to seventh inning.